Have you ever noticed how the snow packs on a car windshield after a heavy snowfall? While the temperature is cold, the snow sticks to the surface and doesn’t slide off. After temperatures warm up a little, however, the snow will slide down the front of the windshield, often in small slabs. This is an avalanche on a miniature scale. On the other hand, a mountain avalanche in North America might release 229,365 cubic meters (300,000 cubic yards) of snow. That’s the equivalent of 20 football fields filled 10 feet deep with snow. However, such large avalanches are often naturally released. They are primarily composed of flowing snow but given their power, they are also capable of carrying rocks, trees, and other forms of debris with them. In mountainous terrain avalanches are among the most serious objective hazards to life and property, with their destructive capability resulting from their potential to carry an enormous mass of snow rapidly over large distances. Avalanches are classified based on their form and structure, which are also known as “morphological characteristics”. Some of the characteristics include the type of snow involved, the nature of what caused the structural failure, the sliding surface, the propagation mechanism of the failure, the trigger of the avalanche, the slope angle, direction, and elevation. All avalanches are rated by either their destructive potential or the mass they carry. While this varies depending on the geographical region – – all share certain common characteristics, ranging from small slides (or sluffs) that pose a low risk to massive slides that come that pose a significant risk. An avalanche has three main parts: the starting zone, the avalanche track, and the runout zone. The starting zone is the most volatile area of a slope, where unstable snow can fracture from the surrounding snowcover and begin to slide. The avalanche track is the path or channel that an avalanche follows as it goes downhill. The runout zone is where the snow and debris finally come to a stop. Several factors may affect the likelihood of an avalanche, including weather, temperature, slope steepness, slope orientation (whether the slope is facing north or south), wind direction, terrain, vegetation, and general snowpack conditions. However, weather remains the most likely factor in triggering an avalanche. During the day, as temperatures increase in a mountainous region, the likelihood of an avalanche increases. Regardless of the time of year, an avalanches will only occur when the stress on the snow exceeds the strength either within the snow itself or at the contact point where the snow pack meets the ground or the rock surface. Although avalanches can occur on any slope given the right conditions, in North America certain times of the year and certain locations are naturally more dangerous than others. Wintertime, particularly from December to April, is when most avalanches will occur with the highest number of fatalities occurs in January, February and March, when the snowfall amounts are highest in most mountain areas. In the United States, 514 avalanche fatalities have been reported in 15 states from 1950 to 1997. In the 2002–2003 season there were 54 recorded incidents in North America involving 151 people. In Canada’s mountainous province of British Columbia, a total of 192 avalanche-related deaths were reported between January 1st, 1996 and March 17th, 2014 – an average of roughly ten deaths per year. During the winter of 2014, avalanche concerns also forced the closure of the Trans-Canada highway on a number of occasions. Not too surprisingly, Earth is not the only planet in the Solar System to experience avalanches. Wherever their is mountainous terrain and water ice, which is not uncommon, there is the likelihood that material will come loose and cause a cascading slide to take place. On February 19th, 2008, NASA’s Mars Reconnaissance Orbiter captured the first ever image of active avalanches taking place the Red Planet. 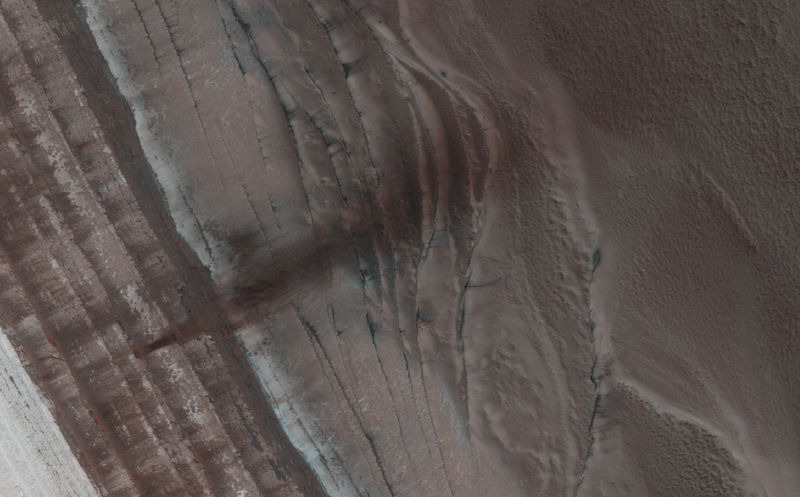 The avalanche occurred near the north pole, where water ice exists in abundance, and was captured by the MRO’s HiRISE (High Resolution Imaging Experiment) camera completely by accident. The images showed material – likely to include fine-grained ice dust and possibly large blocks – detaching from a towering cliff and cascading to the gentler slops below. The occurrence of the avalanches was spectacularly revealed by the accompanying clouds of fine material (visible in the photographs) that continue to settle out of the air. The largest cloud (shown in the upper images) was about 180 meters (590 feet) across and extended about 190 meters (625 feet) from the base of the steep cliff. Shadows to the lower left of each cloud illustrate further that these are three dimensional features hanging in the air in front of the cliff face, and not markings on the ground. The photo was unprecedented because it allowed NASA scientists to get a glimpse of a dramatic change on the Martian surface while it was happening. 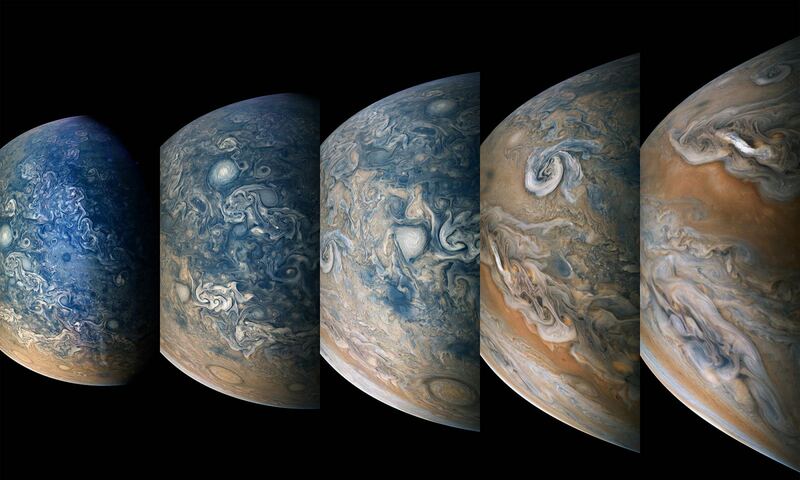 Despite seeing countless pictures that have detailed the planet’s geological features, most appear to have remained unchanged for several million years. It also showed that terrestrial events like avalanches are not confined to planet Earth. We have written many articles about the avalanche for Universe Today. Here’s an article about the Mars avalanche predicted by geologists, and here’s an article about the volcanic tuff. If you’d like more info on avalanche, check out NASA Science News: Avalanche on Mars. And here’s a link to the American Avalanche Association Homepage.